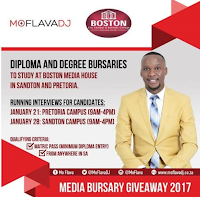 For the seventh year running, Metro FM radio personality and Club DJ, Mo Flava, is set to give away 10 bursaries to potential students with a minimum diploma entry matric certificate through Boston Media House. “It’s a privilege to be able to contribute towards educating the future members of the media industry. The students that have gone on to graduate are doing amazing things in their respective fields and I strongly believe their Boston Media House training has positively contributed to the success in their careers as it has in mine,” he says. This year’s prospective candidate interviews will be held at both the Sandton and Pretoria Boston Media House campuses. Mo Flava will personally conduct all the interviews, after which he will select 10 candidates who will receive bursaries. All prospective media students from across the country are encouraged to attend these sessions. Previous winners of the Mo Flava Boston Media House bursaries have come from across the country including areas such as KwaZulu-Natal, Taung District in the North West, and Soweto in Gauteng. Mo Flava has made a difference in the lives of many students and he has seen various young students begin working towards getting their qualifications so they can make a positive contribution to society. For more information, visit www.moflavadj.co.za. Alternatively, connect with him on Facebook, on Twitter or on Instagram.